Choosing a cloud vendor is one of the first steps in the migration to the cloud. We’ve looked at what companies expect from their cloud services providers, but what sets one apart from the rest of the pack? While price is an obvious point of differentiation, we found that companies with more mature cloud migration strategies have different priorities than their peers. Which of these qualities differentiate a provider from others in your decisions regarding service providers? Rank the top three. Price is much more of a concern for smaller companies—41% list it as their top priority versus 5% of the largest companies. 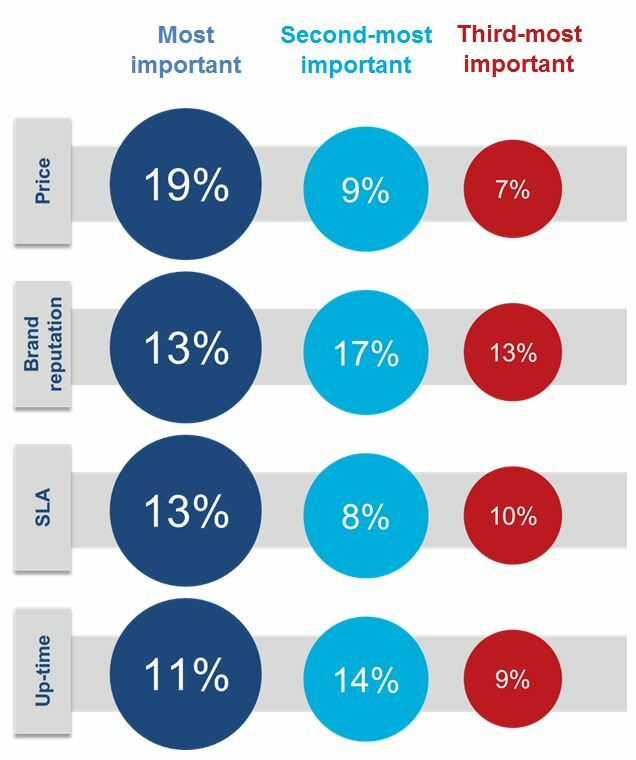 Instead, large companies are much more likely to choose a provider based on brand reputation and portal capabilities. We also identified a group that is further along the path to value than other survey respondents. Trailblazers, as we call these companies, are more likely to value pre-sales engineering that aligns a solution with business needs, as well as portal capabilities and additional services like network application and support. We will be exploring what sets Trailblazers apart in future posts.